REPORTING FROM WIMBLEDON, ENGLAND — You wouldn’t think a tennis line judge would have a dangerous job. But two weeks after a player was defaulted for having a temper tantrum that injured a line judge, another line judge was hurt Monday. This time, at Wimbledon. American Mardy Fish hit a 118-mph serve into the right eye of a female line judge. Fish led Jo-Wilfried Tsonga 4-3 in the first set and crushed a serve up the middle, wide. The line judge yelled that the ball was out, and the next sound you heard was a thud off her face. How Far Can Mardy Fish Go? Should We Buy in? Does he Believe? How much should we buy in? How far can he take this? Up to now, his story is about his newfound maturity and commitment late in his career, his weight loss and commitment to fitness. It was a cute story when he passed Andy Roddick in the rankings this spring to become the top-ranked American. Roddick wrote him a note of congratulations and said he’s coming back to reclaim that ranking. But the truth is, it wasn’t just a nice moment for Fish, and Roddick isn’t going to pass him back. Fish isn’t just the top-ranked American. He is the best American. For now, no other American man can win a major championship. Can Fish? The stars would have to align. REPORTING FROM HOUSTON — Andy Roddick wore the white jumpsuit, a No. 23 on this chest, green ballcap and sunglasses, and he lugged the golf bag as the caddy for Zach Johnson Wednesday in the Par 3 contest at Augusta National. It was the day before the Masters. On the 9th hole, Johnson allowed Roddick to hit the tee shot. It became a buzz moment for tennis. 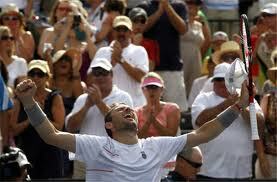 Roddick has a way, just by being Roddick, of bringing attention to himself and to his game. (It doesn’t hurt that he’s married to Brooklyn Decker, Sports Illustrated swimsuit cover model). And tennis can use the attention. So in the best interest of tennis, I shouldn’t begrudge Roddick of another moment. Someone else should be having tennis’ moment. It’s tonight in Houston, the marquee match at the U.S. Clay Court Championship. 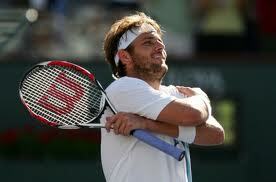 Quietly, Mardy Fish will be having a personal moment, I guess, when he plays Albert Ramos of Spain. It will be first time Fish plays as the top-ranked American.